You lead a life on the go, full of technology and opportunities. You prefer to do things on your own time. We get that - which is why First Bank is now at your fingertips. 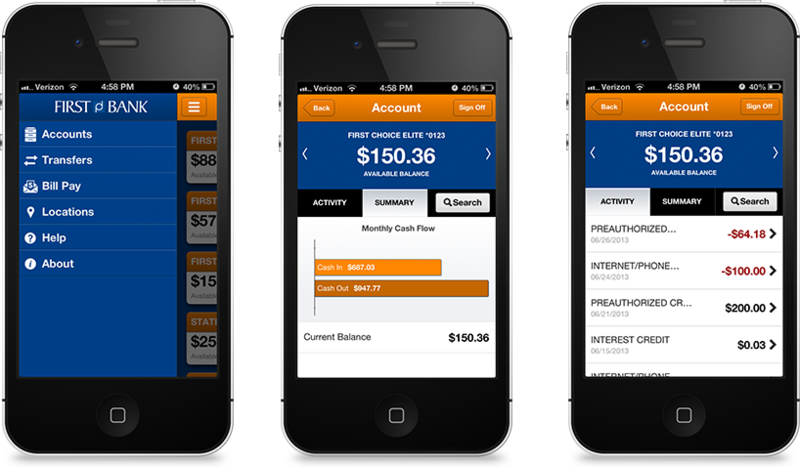 As convenient as it is effortless, First Bank’s mobile app is the future of personal finance. Never before has banking been suited to your life and style as it is today. We will be here when you need us, but in the meantime, bank on your watch and from your very own pocket. Get My Pocket Bank today! Just log in to your First Bank Online Banking account, activate your device, and download the app from the App Store or Google Play. Mobile texting is also available for all text enabled phones. Standard message and data rates apply. Yes, the mobile banking service utilizes best practices from online banking, such as HTTPS, 128-bit SSL encryption, or password access and application time-out when your mobile device is not in use. Only the mobile devices that you personally enroll in the service can access your accounts. In addition, no account data is ever stored on your mobile device. And in the event your mobile device is lost or stolen, the service can be immediately disabled by either going online to the Mobile Banking enrollment website or calling First Bank Customer Support at (765) 962-2581 or (800) 548-8138. What is First Bank Mobile Banking? Mobile banking gives you access to your accounts from your mobile web browser or a downloadable mobile banking application, depending on your preference and your mobile device capabilities. Both options allow you to: view account balances, search recent account activity, transfer funds, pay bills and find nearest ATM or branch locations. Sign in to Online Banking on your computer and choose the Mobile Banking option. Enroll your mobile device and follow the instructions. If you use challenge questions for online banking, you can enroll for mobile banking directly from your mobile device by entering the mobile web URL (http://m.firstbankrichmond.com). At the time of activation, a "cookie" is stored on your phone's browser which allows the Mobile Banking system to remember that you activated. The cookie is only visible by the Mobile Banking system and does not contain personal information. Some phones may require you to enable cookies or periodically erase them, requiring reactivation. If you are experiencing this issue, check your phone settings to ensure that cookies are enabled. If cookies are enabled and the issue persists, please contact your mobile network carrier for cookie support information on your mobile phone. If you would like to reactivate, text R or RECOVER to 79680. 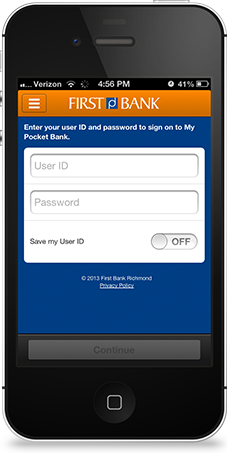 If First Bank Richmond supports enrollment on your mobile phone, you will not need to provide an activation code. However, you may be asked to enroll again due to issues with cookies. How do I navigate Mobile Banking links with my mobile device’s browser? Mobile Banking is supported on most phones with a mobile web browser that supports cookies. In addition, the mobile application is available on many smartphones including: iPhone and Android. Both mobile web and mobile applications can be found by entering the mobile web URL (http://m.firstbankrichmond.com) in your phone's browser. Select the URL link -- http://m.firstbankrichmond.com -- in the text message. This is typically done by selecting a command on your phone's menu, such as "Connect" or "Go To."